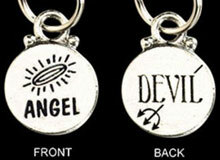 These charms are sure to look great on your pets collar. Add some bling-bling to your pet's wardrobe! All include a split ring for attachment unless otherwise noted. Quick Links are for quick and easy tag changes between collars. The barrel unscrews to quickly switch between collars. The Quick Link on left 1 1/8" long and 1/2" wide. The Quick Link on right 1 1/2" long and 3/4"" wide. The recommended placement for the Quick Link is over the collar itself , next to the D-ring, not attached to it.